We were fairly successful at growing pumpkins this year. Sometimes they’re hit or miss, mainly because the squash bugs in Idaho really like them, and also because you have to plant them early enough to get a good harvest, which is sometimes tricky with our cold, slow springs. I do not grow jack-o-lantern pumpkins; just don’t see much sense in growing something you can’t eat. We even managed to grow a few of the gorgeous Cinderella pumpkins, pictured above. 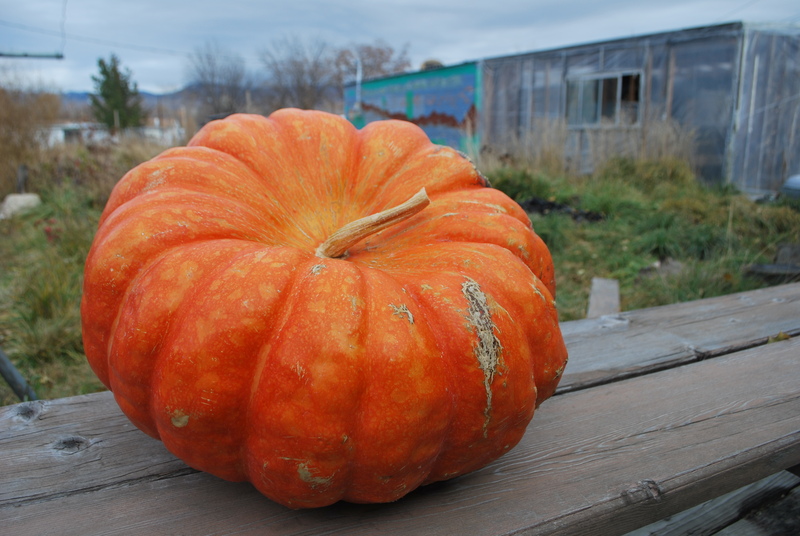 One refugee farmer had one vine, which yielded 3 or 4 of these amazing pumpkins. They are not only huge and gorgeous, but make the best pumpkin pulp I’ve ever cooked with: lovely orange, not too stringy, and very flavorful. I do recommend this variety for the home gardeners out there! Most recipes for pumpkin pie, bread, etc., call for canned pumpkin. But I’ve got a mountain of fresh pumpkins here, so why eat something out of a can? When I want to cook with a real pumpkin, or a winter squash, I take the whole thing, seeds and all, and put it in the oven and bake at 350 degrees until soft. Supposedly baking it with the seeds inside enriches the taste of the pumpkin, and it eliminates the need to cut, seed, or peel a very hard pumpkin or squash, which can be dangerous! When it’s done, take it out and let it cool. Then it will be easy to cut and remove the seeds and peel. At this point you’ll have a pile of pumpkin goop. It will be stringy and somewhat wetter than the pumpkin that comes out of a can. 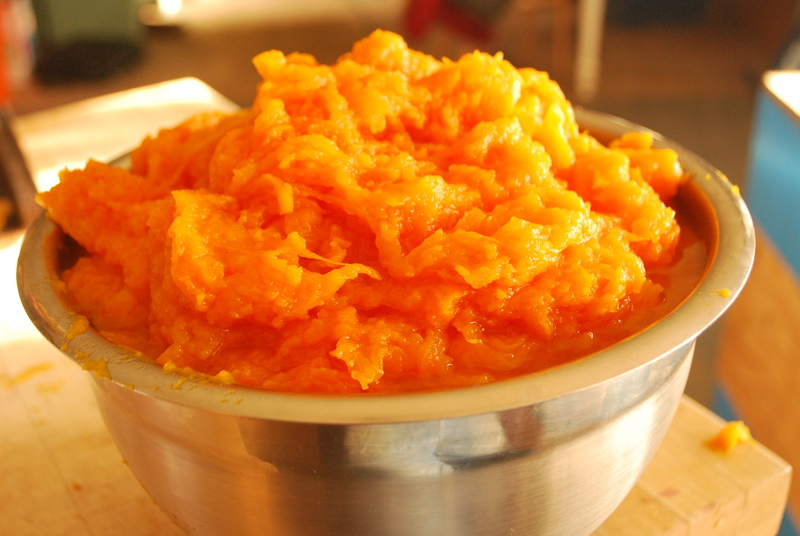 Next put it in a food processor to eliminate the stringiness and get a consistently textured pulp. You can probably use a blender if you don’t have a food processor. Now your pumpkin is ready to use in a recipe. Pumpkins vary a lot, but if yours is very wet, you might want to reduce some of the other liquid in the recipe. In this recipe, I reduce the milk from the original. 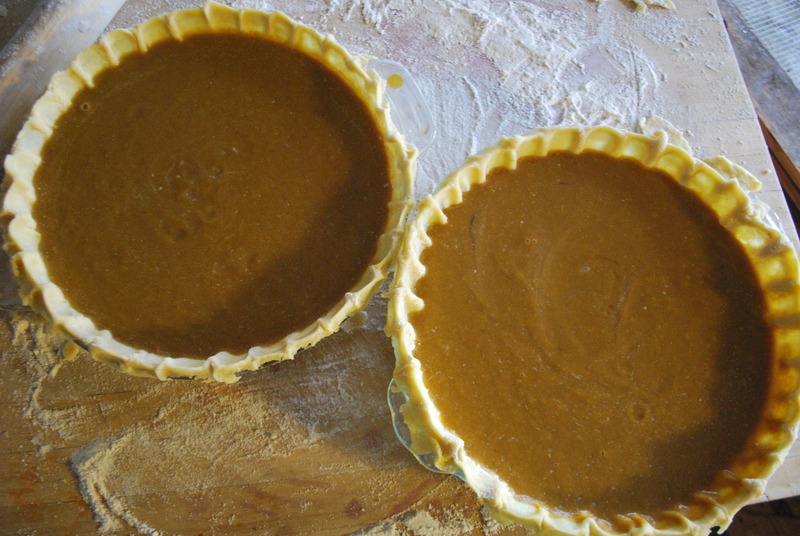 Gluten-free and/or healthier version: Skip the crust and cook just the filling in a pie plate or in smaller ramekins, for a gorgeous pumpkin custard. Marty just can’t get enough of this pie, so to make it a little healthier, I sometimes make it crustless, eliminating the fat and flour in the crust. As you may have noticed, other than the cup and a half of sugar, the rest of the filling ingredients are fairly healthy. Another gluten-free option: I tried this recipe with a nut crust, for a party where the hostess was a gluten-free person. It’s getting pretty common these days, so it’s good to work out some options. I did a nut crust: 1 cup finely chopped walnuts, 2 Tbsp softened butter, 2 Tbsp sugar. The recipe said to bake the crust before filling because it would stay together better and be easier to remove from the pan. 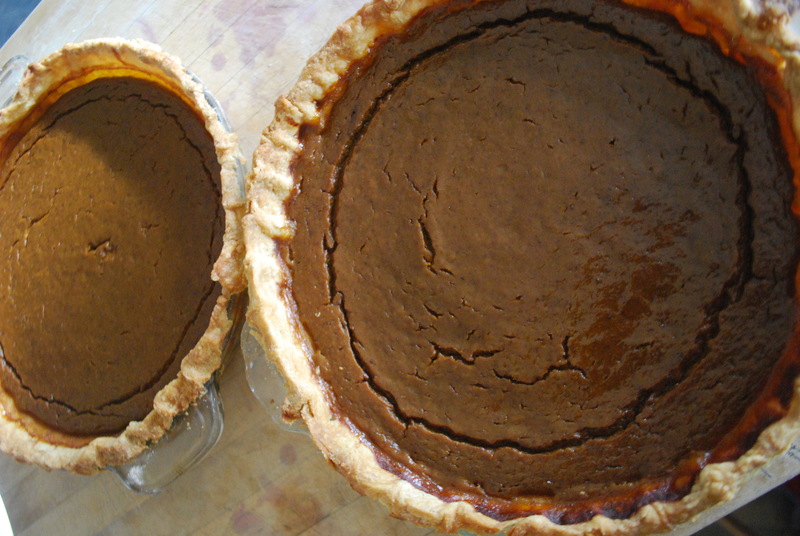 However, since the pumpkin filling takes so long to bake, the crust ended up a bit burnt. Fail. If you do want to try it, skip baking the crust first. Another website I checked suggests freezing the nuts first for a better consistency crust. Let me know if you try something that works! Tags: baking, Cinderella Pumpkins, cooking with pumpkin, dessert, gluten free baking, gluten free pie crust, gluten free pumpkin pie, Pumpkin Pie, recipes, Thanksgiving. Bookmark the permalink. Gorgeous! My husband has been growing Cinderellas for some time now. Did you see my posts about our huge pumpkin harvests and all the amazing things we were able to make from just one Long Island Cheese? AWESOME!! I definitely think it tastes more “real” when you use a fresh pumpkin! Awesome! Ellen and I have made two pumpkin pies from scratch this year, as well as a chioggia pumpking soup. Plus I’ve made succotash with lentils and pumpkins a few times. The farmers market by our house in D.C.has great pumpkins and squash – the better for us!